Okay, so still you think that LinkedIn is just a professional site which helps you build a competent profile to hunt the right workplace for yourself. But.. guess what? This isn’t the case any longer! LinkedIn has evolved brilliantly like no other social network in the web world! 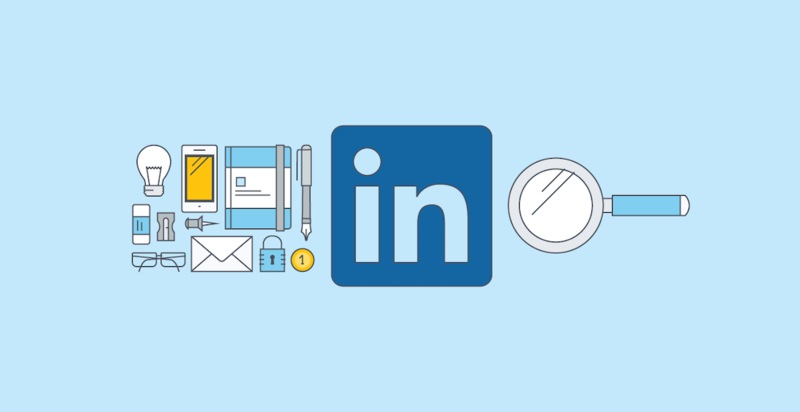 And above all, from being directly connected with your influencers to knowing each and every bit about organizations in your industry… You have it all on LinkedIn! LinkedIn owns a unique feature of which most of us would not even know. And that is pretty shocking because this my friend is a feature which should be digged inside out! You must have known about the usual ‘Search Bar’ that you see on the top of LinkedIn’s website. And you might have damned that search bar at the times when it couldn’t help you in searching that particular person from another network… Or that entrepreneur who just launched a startup of your niche in another country. These are the times when you need Wider Search Parameters! And it is what this unique feature is all about! You want me to spill the beans already.. Right?! Don’t worry because I’m about to do that! It’s ‘Advanced People Search’, my mates! Yes, Advanced People Search or often referred as APS, is a feature which allows you to broaden your search through a wide variety of parameters. 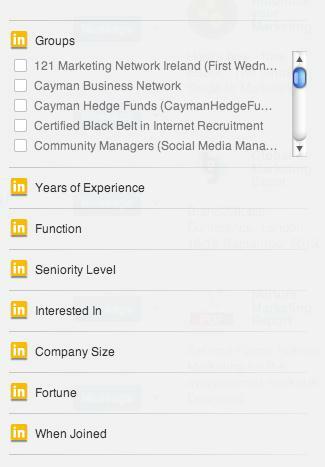 With the use of this Search Feature, now you can completely dig anything out which you have been failing to find on LinkedIn for so long! 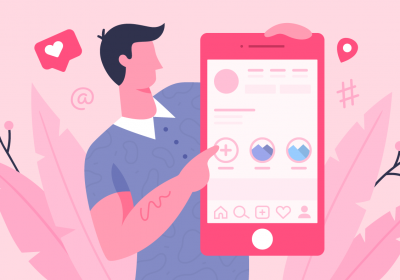 So just celebrate, because today I am going to explain every bit of this feature in this post and trust me by the end of it, you’ll be an Advanced People Search Guru. Where is this feature located? This page pop ups when you click on the ‘Advanced’ tab beside the usual Search bar. What are the Search Parameters available in this? With this feature, you can literally search all the specific sections of a person’s profile. 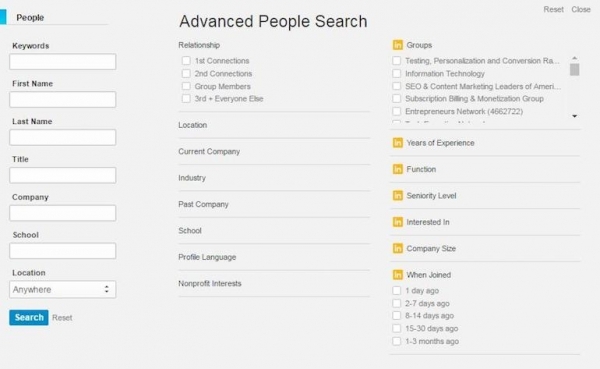 LinkedIn has an array of Boolean Search operators in order to expand the search. The search operators are: AND, OR and NOT. This searches all the words written on LinkedIn Profiles. It also searches for the symbols, like ‘@’ to find people who have their email addresses in their profiles. Again, this is self-explanatory as well. This searches a person’s last name. This searches for the words written in person’s Job Title field. 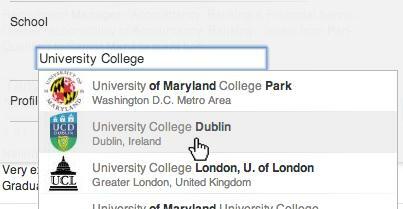 The drop down menu helps you narrow down your research to which job are you searching for. The menu appears once you have entered a title in the field. When you select “Current or past”, the search engine will look for the keywords in the person’s Title and job description, in the Headline that appears under your name, in Recommendations and Summary fields. So it is a vast search where no field is left while hunting down the keyword. This searches for keywords in the Company field, the Summary field and the Headline field. This searches for the keywords in the Education section, including the name of the institute, the grades a person got and the description of the person’s academic achievements. This searches for a specific country, it asks for the postcode within a region of a radius around 160 kilometers or 100 miles. 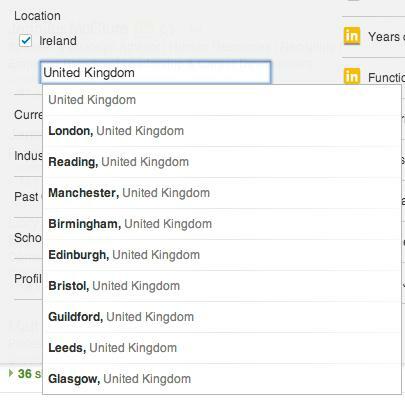 If you select from the drop-down menu and select “Anywhere”, then it will run a global search. This section gives you all the options. You can either select ‘All’ or any particular option. This search field will give you options which are set already along postcodes within a region of a radius around 160 kilometers or 100 miles. 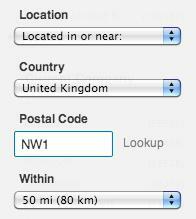 You can also ‘Add’ a location of your own, once you start typing it will start giving you related options. This will let you manually type in company names that you want to search. Once you start typing, a prompt list will appear in front of you and from which you can select the relevant company. The prompt list will give you all the company names which have their LinkedIn account made up already. You can add as many companies as you want. And you can also leave this field blank if you do not want to specify. This search field has all the options available which appear to you when you type in the main industry you worked in or of your interest. This one is just like the ‘Current Company’ option. 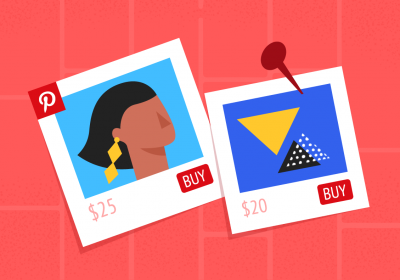 This is good for finding people from past companies you have worked for. This search bar allows you to manually type in your educational institute. This will show you options for the institutes that have made their LinkedIn Profiles. You can also type any school which is not in the list. This searches for the language a person has specified in his profile. This can also specify your search in case someone has put in a foreign language he knows which isn’t really common. This one is mainly for the Premium Account Holders which you buy after a certain amount of payment. This searches for the groups or networks. This is quite a general search. The box can be used by the Basic account holders and the Premium ones. Now, this search is restricted for the Premium account holders only. It searches for the years one has spent working. This is also restricted. This searches for the field a person works at. This searches for an option which is not provided to the Basic account holders, it is only filled by the Premium Account holders. So although it’s an added field in Premium feature but it doesn’t seem of much important if you want to look for specific professionals. 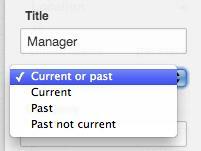 This searches for the years a person has worked for a company. It is a good feature as it specifies your research. This gives you a chance to choose from the 5 available Fortune-listed company sets, from Fortune 50 to Fortune 1000. This is a great feature which can provide you with people who have mentioned this about their companies or if you are searching for the big companies. This filter will tell you that a person is a new job seeker or not. For example if he joined 3 months ago, then he is definitely looking for one. LinkedIn Advanced People Research is a great way to find new candidates, the new entrants in your industry, your competitors and your seniors to look up for mentors. By entering each and every detail, you can literally find the exact person you are looking for. So here is an end to the search which was used to create a lot of fatigue and welcome to this new tool which had made it so simple and quick for us. BONUS: For more details check out these Deep Insights on Advanced People Research from another perspective! I am a tech entrepreneur who loves writing about Marketing, Entrepreneurship and SaaS.